"Im Rahmen der Art Basel eröffnet die seit 2006 existierende Carhartt Gallery am 6. Juni 2009 ihre neue Ausstellung Public Provocations. seit 14. Mai 2009 am Holstenplatz in Hamburg ! mit funk 25, mindfuck, marybel, auzone, los piratos, d3u, pirho, anne pfirsich, quasikunst, rebelzer, tona, tx, holzweg, wiesel, dr. ocioso u.v.a. The "Oversized and Underprized"-Exhibition stops in Hamburg! 22.12.2007 - Wie subversiv ist Street Art wirklich? "Return of the living Dude" - Halloween special with our favourite street comic hero Keule - exclusive on reclaimyourcity.net! Die Wurstbande und Sam auf Tour in Budapest! Das 22 Seiten starke Tagebuch zur Reise mit den Abenteuern der Wurstbande und der SamCrew gibt es hier zum Download. We recieved some Pics from Oventic, San Cristobal de las Casas & Oaxaca in Chiapas/Mexico. "When I was a child" - Artiste-Ouvrier, french stencil-artist and founder of WCA (working class artists) free university of stencilart, shows a projektion of his stencils at the assoonas gallery Hamburg. Entstanden während des 24h-Comic-Tags der Comicbibliothek Renate in Berlin. Big "Special Edition" Sneaker Auction at the Superplan-Gallery in Berlin on the 14.04.2009 starting at 19:00! Wurstbande & Keule Doppelausstellung in einem Headshop in Berlin-Prenzlauer Berg. Der Wurstkanzler war auch dabei. Many new pictures from Liverpool and Birmingham arrived. Thanks to HUJ. In der Woche vom 21.2. bis zum 27.2. stellt die “Writing my Name” Workshopgruppe aus der Alten Feuerwache Berlin im New York Bethanien aus. Ein Programm zum aktiv werden, eine Dokumentation der halbjährigen Entwicklung des Workshops. 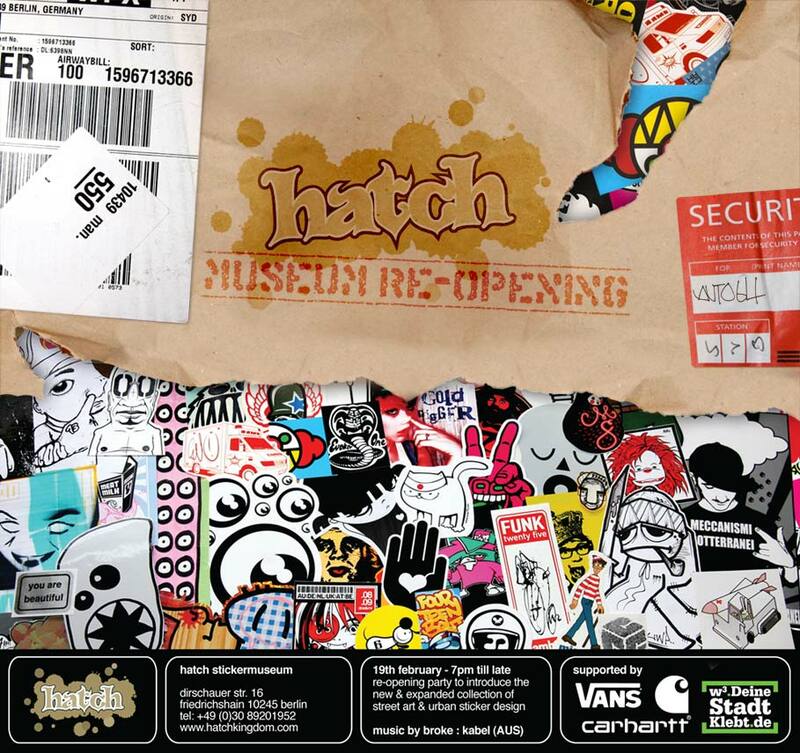 The Hatch-Stickermuseum celebrates its Reopening / 19.02.09 @ Dirschauer Str. 16 in Berlin Friedrichshain. Flyer. 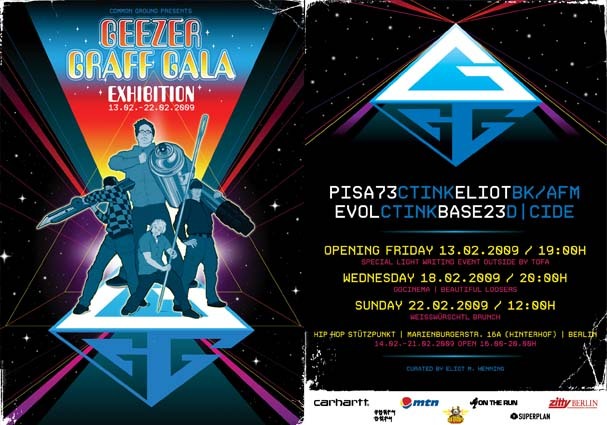 From the 13th till the 22th Februray 2009 our Friends Evol, Pisa73, Base23 & Eliot will exhibit at the "HipHop-Stuetzpunkt" in Berlin (Marienburgerstr. 16A Backyard) (Flyer). We received a pile of pictures from blockitsch, so you dont have to go there to check it out! Here is the shortcut to the goodies.